Jonathan Rea in action in Sunday's race at Phillip Island in Australia. Jonathan Rea was narrowly denied his first World Superbike victory of 2018 in a dramatic dash to the line in race two at Phillip Island in Australia on Sunday. 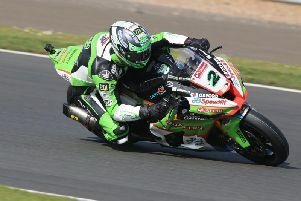 The Kawasaki rider held a slender advantage after the final corner but was out-gunned by the Ducati of Italian rider Marco Melandri, who secured a dream double Down Under to lead the championship after the opening round. Reigning World Superbike champion Jonathan Rea celebrates his runner-up finish at Phillip Island. It was a satisfying result nonetheless for reigning champion Rea, who dropped to fifth place in Saturday’s first race due to a problem with his rear Pirelli tyre. However, there was disappointment for Eugene Laverty, who crashed out of the lead of the race on the Milwaukee Aprilia, fortunately escaping unscathed. Laverty was able to continue in the race and clinched a point as he finished in 15th place. Chaz Davies, third in Saturday’s race, was also a faller on the Aruba.it Ducati as the Welshman went down while leading the race with nine laps to go. As a safety precaution, race two was held as a flag-to-flag contest, with riders required to make a mandatory pit stop to change their rear tyreduring a three-lap window to ensure their tyre option lasted out the full 22-lap distance. Rea took the lead on lap 20 but the Ulster rider was unable to fend off Melandri’s last-gasp charge as he was denied by only 0.021 seconds. Spain’s Xavi Fores completed the top three on the Barni Ducati. Three-time champion Rea said: “My only chance to win the race was to try and be in the lead out of the last corner. On the penultimate lap and during the race they were passing me on the straight. “When I got passed by Marco into T1 I just thought ‘I am going to let the brakes off and go right down the apex and see what happens.’ I wanted to put together the best last lap I could but all weekend we have been struggling with fourth gear. It was too long for that corner and we did not have enough drive on the exit,” he added. “I could not get it done today and I made a bit of a mess of my pit exit. I completely forgot to change into second gear to release the pit rev limiter and both [Michael] van der Mark and Fores came past me, so I lost track position. Tom Sykes (KRT) finished fourth ahead of Alex Lowes (Pata Yamaha) and Leon Camier on the Red Bull Honda. Melandri leads the standings on a perfect 50 points from Sykes (33) and Rea (31). Round two will take place at the Chang International Circuit in Thailand from March 23-25.